An all-white kitchen never goes out of style. Everybody wants a white kitchen because of its versatility and pure clean look. However, having an all-white colour scheme doesn’t have to appear bland or clinical since there are several ways you can add an interesting twist to create a timeless kitchen. Here are four wonderful ideas to create various styles of white kitchens. Throw in some bright colours in your all-white kitchen to give it an edgy feel. When you choose the colour white for your kitchen cabinets, island, countertops, windows and ceiling, inject a dose of alternative colours to the space through your kitchen furniture. For example, select bright blue, canary yellow or electric green colour for your dining chairs or barstools to add the right amount of zing to the overall white backdrop. You can also keep some indoor plants near the sink to add some more splashes of colour. To complete the look, select chrome knobs for the cabinets. To create this style, keep your kitchen flooring, cabinetry and kitchen island white. Instead of installing upper cabinets, use antique chestnut shelves to resemble a ship’s deck. Select stainless steel appliances and large light fixtures to echo the style of metal boat fittings, complementing the theme. For the backsplash, choose royal blue tiles against the backdrop of white walls because nothing seems more nautical than the combination of white and blue. You can also put up open shelves in the blue backsplash area to showcase your white dishware and crockery. A kitchen can be much more than a space to just cook food. If you want to design the space into a hangout area for your family and guests, focus on creating a sense of symmetry. If you have a big kitchen, then consider getting cabinets with glass fronts to keep the space looking airy. But if you have a small kitchen, avoid cluttering it with too many cabinets and make sure to keep all kitchen essentials organized or stored in drawers. For a coastal feel, place woven chairs or stools and hang glass pendant lights over the kitchen island. Although there aren’t any set rules for the farmhouse style colour palette, the most popular combinations are white, black and natural wood tones. For example, you can choose rich heart-pine floors, white cabinetry, white window frames, black quartz countertops and a wooden top dining table for your farmhouse style white kitchen. You can add a refreshing pop of colour by painting your walls in apple green colour. Follow these ideas and transform your kitchen from drab to dazzling! 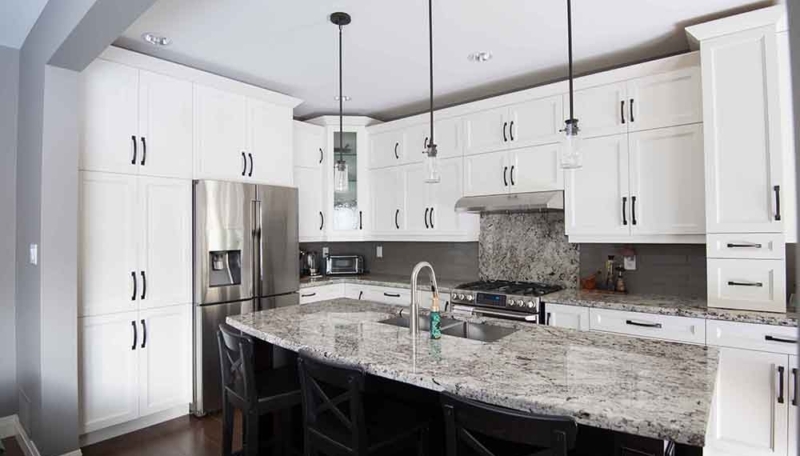 If you’re looking for a kitchen renovation service in Mississauga and the GTA, contact Euroline Kitchens. We have a proven record of providing premium services.